Easy Inventory system easy to set up and simple to use. 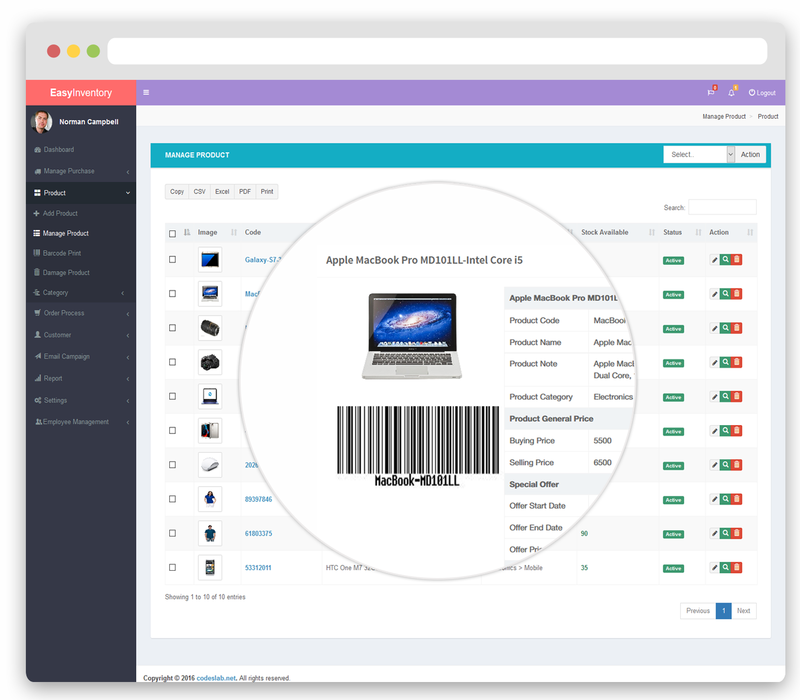 You’ll want a manage your product easily keep track record purchase of your product, generate your product Bar-Code easily. Easy Inventory system with an intuitive interface to process sales quickly and keep lines moving. Training cashiers and managers should take minutes, not hours. 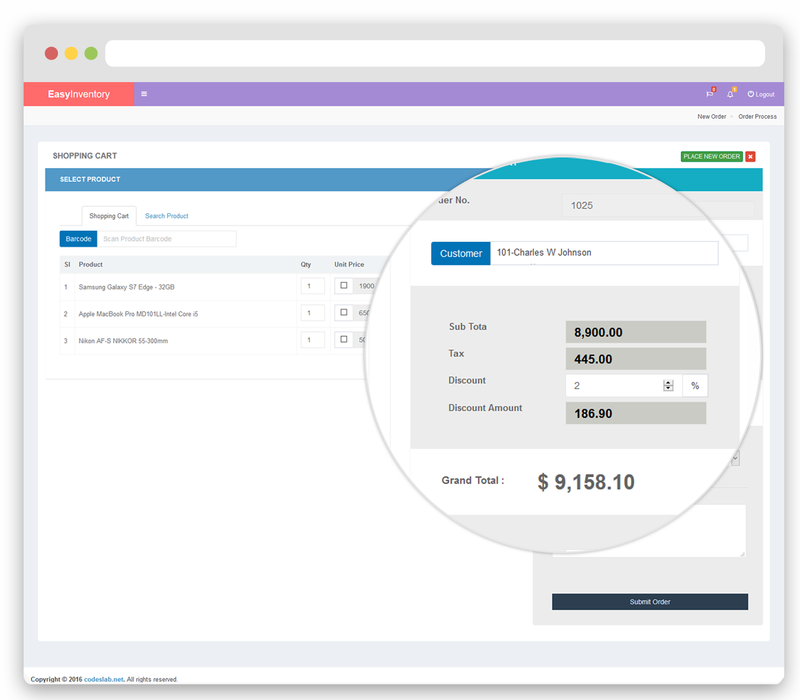 Intuitive interface to process sales quickly and keep lines moving. 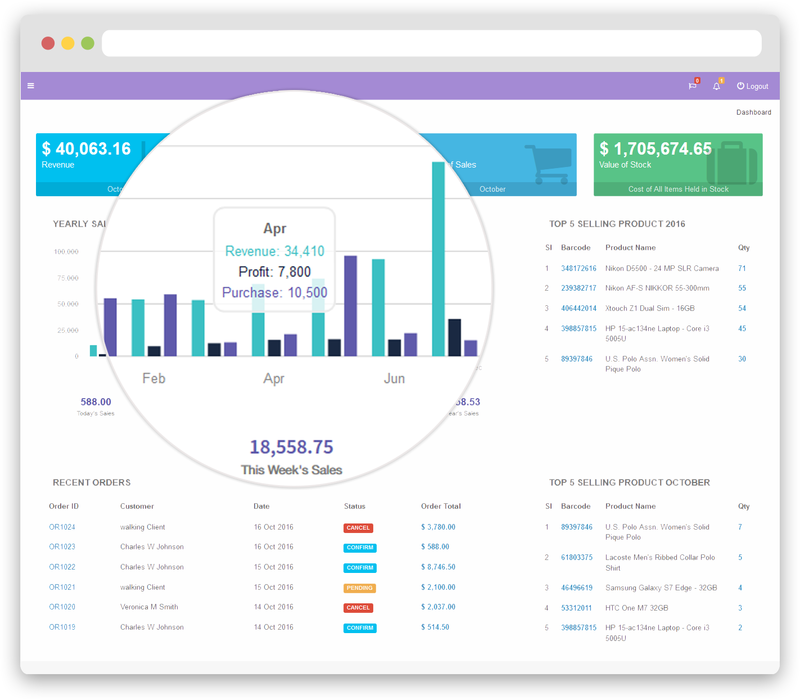 Beautiful Dashboard where your business will reflect at a glance. Beautiful Dashboard where your business will reflect at a glance. With graph chart you will find your each month purchase, revenue and profit data. you will find value of your stock, today, weekly, monthly and yearly sales data. Top 5 monthly and yearly sales prodcut report. you will find top 5 recent order with confirm, pending and cancel messages. you will get notify which products are running out of stock, pending booking notify to take action as well. 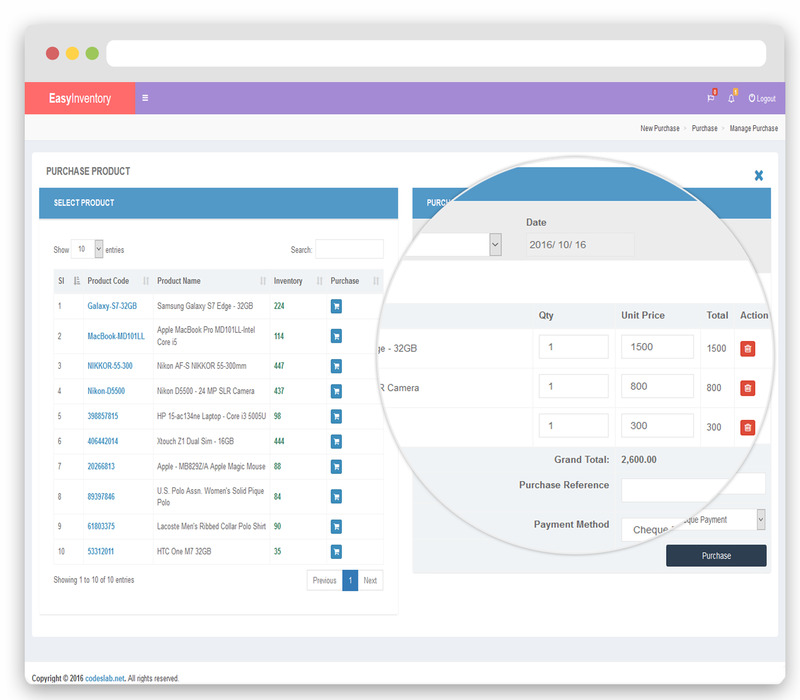 Categorize your products by name, type, SKU, tag, easily create and manage product inventory. Managing inventory should be straightforward and painless. Remember that some POS system that’s confusing to learn or complicated to use will decrease employee satisfaction and waste time that could be better spent elsewhere. Its very simple to manage your product price. there is couple of way you can manage your product price, general, date range festival or special offer, tire price you can set to make your POS to easily handel and pick the right product price from database. Easy inventory will generate barcode automatic as per your product code when one you input. you can set product insufficient notification when product stock will go bellow notify stock. it will alert your product is going to out of stock. It's easy to select single or multiple product for sales, you can add product by barcode scanner. any barcode device will work with Easy Inventory System. you can put manually put product price in very special case. Easy to select customer an order it will calculate automatic customer discount rate. there is two type customer discount rate can add e.g. flat or percentage rate. you can put also manual discount rate for wal-in-client or register client if you wish. when you will place your order you can put billing, shipping address, any special note for this order. Add new supplier, place purchase order to supplier. 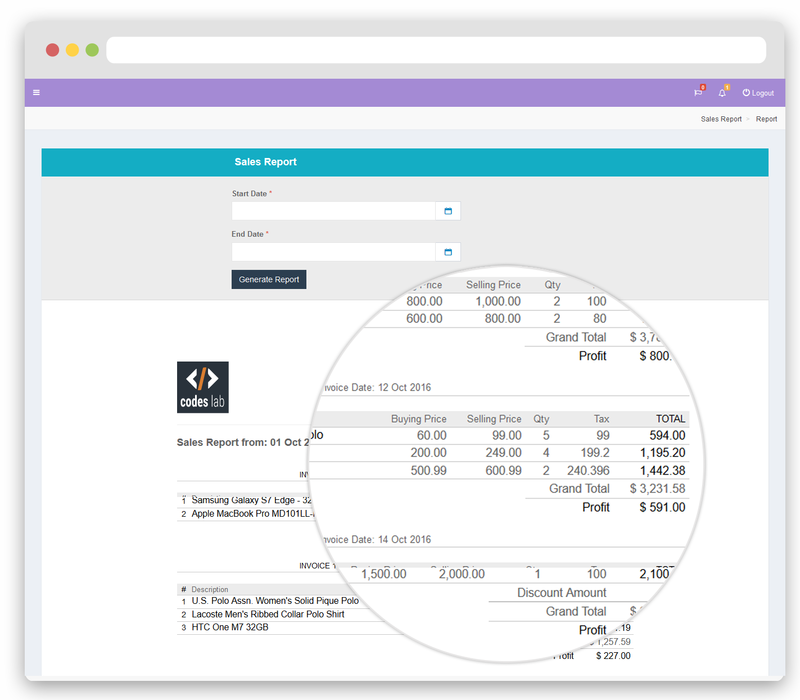 keep record all of your purchase order, generate invoice. Add new customer, set customer discount by two category, flat and percentage discount rate. add customer address. Powerful report generate to pull your business scenario.